CHULA VISTA, Calif. – An emaciated dog in Chula Vista -- seen in a photo that has prompted outrage -- had normal blood work when taken to a vet Wednesday, city spokesperson Anne Steinberger told 10News. A photo circulating online shows a brown pit bull that looks more skeleton than dog nursing a group of round, well-fed puppies. 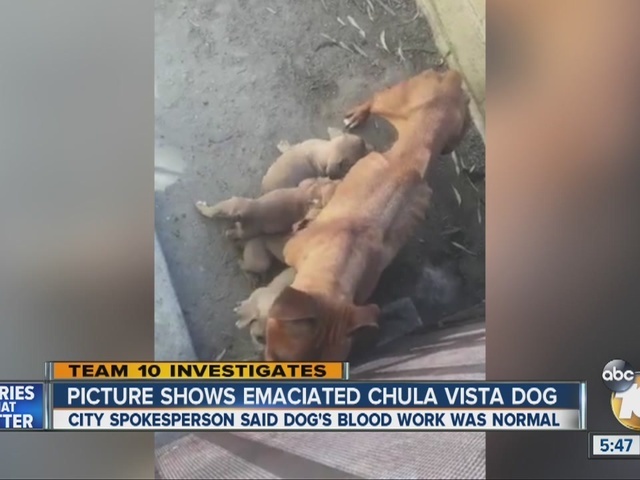 Chula Vista Animal Control was made aware of the photo, and the owners were ordered to have a veterinarian check the dog by 1 p.m. Wednesday, according to Steinberger. The owner complied and had the dog examined on Wednesday afternoon. 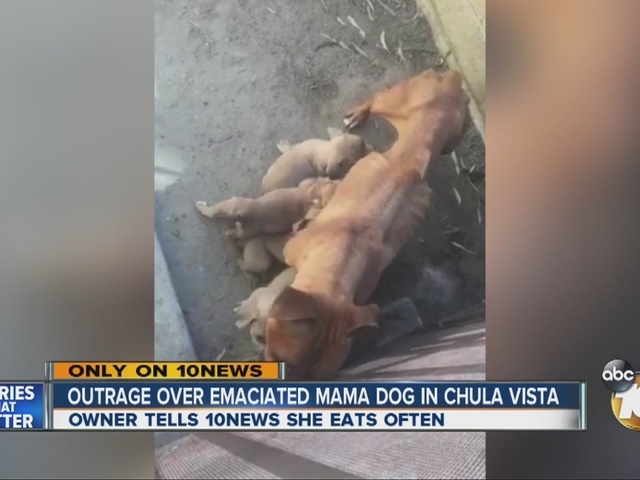 A veterinarian said the dog's blood work was normal and the animal was emaciated because she is nursing six puppies, with the pups taking all of the nutrients from her body. Steinberger said the family was ordered to increase the dog's caloric intake. 10News learned animal control officials will check on the dog's condition in a month. "I just gasped," Heather Nelson said. Nelson said an acquaintance of hers shared an eight-second Snapchat video of the emaciated dog nursing. Nelson was outraged over the dog's sickly condition. "My first instinct was to take pictures of everything before anything was deleted," Nelson said. She took a screenshot of the video and shared the photo on several social media platforms. It's since been shared countless times. 10News tracked down the family who owns the dog in Chula Vista. The niece of one of the dog's owners posted the original video. Her father told 10News the dog's name is Kona and she's about 10 years old. He said Kona eats a lot. He claims Kona is emaciated only because she is nursing. He said she looked the same the last time she had puppies, and recovered. After someone reported Kona's condition, Chula Vista Animal Control officers were at the home Tuesday afternoon. They gave the family 24 hours to get her to a veterinarian, a city spokeswoman said. If they do not comply, officers will remove Kona from the home. Chula Vista police also responded to the home Tuesday evening after the family allegedly received threats.